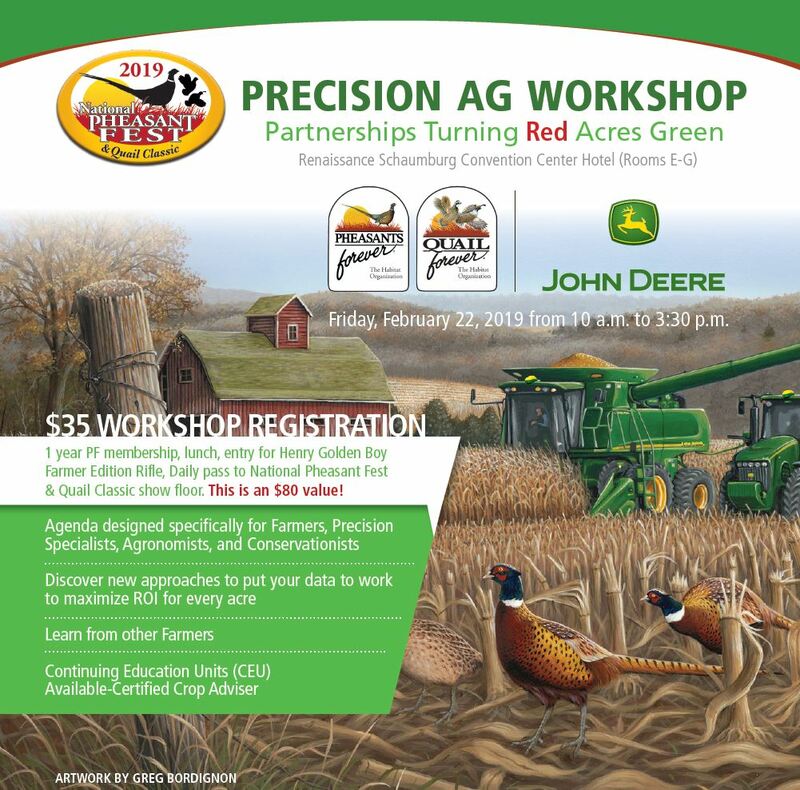 Join us for our 2019 Precision Agriculture Workshop! 1 year PF membership, lunch, entry for Henry Golden Boy, Farmer Edition Rifle, Daily pass to National Pheasant Fest & Quail Classic show floor. This is an $80 value! Agenda designed specifically for Farmers, Precision Specialists, Agronomists, and Conservationists. Discover new approaches to put your data to work to maximize ROI for every acre. Learn from other Farmers! Continuing Education Units (CEU) and available-Certified Crop Adviser. Click here to view the full agenda and click here to sign-up today. Make sure to also purchase your Friday Night Pheasant Fest & Quail Classic Party tickets! Doors Open at 5PM – Tickets Cost $75 | Located at the Renaissance Schaumburg Convention Center Hotel We’ll be keeping the Precision Ag conversation going by hosting an Ag TweetUp at the party. This will be a great way to interact with like-minded farmers and land owners in a relaxed and fun atmosphere. Featuring live music, great food, and exciting raffles and auctions - you won’t want to miss it!